But . 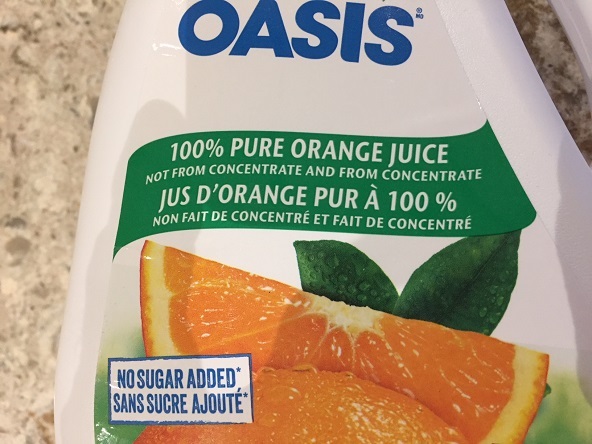 . . is it from concentrate? I’m sure there’s some explanation for this label that makes sense, at least to a lawyer, but I don’t know what it is. Overview: With the coupon I had, I guess it was a deal. But was it a meal? Label: Not much sticker shock from the nutritional guide on this one. The Harvey’s “original burger” is only 360 calories undressed. 17 g of fat and 970 mg of sodium. That’s liveable. As part of the meal deal I had a coupon for, however, it came with a side order of fries. This, remarkably, had the same amount of sodium and 50% more fat than the burger! Throw in a medium soft drink (not my thing, but it’s part of the deal), and some fixings for the burger, and the total came to just under 1,000 calories. That’s still not too bad. Of course there’s nothing here that’s actually good for you, but it’s not a health crisis either. Review: Harvey’s is pretty much the only burger chain I can stomach. The burgers still retain some faint resemblance in taste and texture to a real hamburger patty, and I like that you can watch them make it the way you want it with a nice range of toppings. Like black olives. I put those on everything because I read something a long time ago that said they were healthy. Alas, the burgers are so small that the olives keep falling off. I think some people get carried away with all the choice. The woman behind me in line wanted ketchup, mustard, and relish on her burger. That struck me as in some way counterproductive. It’s like she was making a burger slurry. I really enjoy the atmosphere at my local Harvey’s. There are often a lot of oddballs in there, including, this time, one of the biggest guys I’d ever seen. His head was almost touching the ceiling, which I would have thought was impossible. Ordering was an adventure, as I honestly couldn’t make out a single word the cashier was saying, and she was speaking English. I had to get her to repeat everything three times. Best of all, they always play great classic rock. I ate my meal to AC/DC’s “For Those About to Rock We Salute You,” a song I haven’t heard for decades. It doesn’t get any better than that. The big problem I had with the meal deal itself was that it wasn’t enough. As I’ve said, the burger seemed really small. I think I could have easily eaten three of them in one sitting. I’d already eaten a lot that day, but by the time I finished walking home I was hungry again. So while the numbers weren’t too bad, I wasn’t getting stuffed. To be honest, it felt more like a snack than a meal. Overview: There is a deadly economic imperative that drives our response to buffet dinners. We want full value for our money, even if we’re spending less than $10. And by “full value” what I mean is all the calories and carbs you can handle. Label: I can’t do a full breakdown here because I wasn’t ordering from a menu. My best guess would be that I took in around 2,500 to 3,000 calories. Must have been at least double my daily recommended fat and sodium. There’s no sugar-coating it (though the sugar coating on the apple turnover dessert was delicious): if you limited yourself to eating this buffet even once every couple of weeks, it would kill you. Review: I got to the buffet a few minutes early, and the pizza hadn’t been set out yet. As my hostess pointed out, however, there was salad available as an appetizer. So I had a salad. Then I had another salad. It was very good. Despite the fact that there were three full tables of people in the restaurant already seated when I arrived, I was the only one who had any salad. Everyone else was waiting for the pizza. Once the pizza arrived, they swarmed both sides of the buffet table. I had a booth close to the buffet and kept track of how many people had salad. Over the course of the next forty-five minutes I counted five trips to the salad bin. This is out of approximately forty people who were in the restaurant during this time, making several visits each. Pity the greens. I spent a lot of time observing the diners. They weren’t morbidly obese, yet. They were all big, but most of them were still young. There were a bunch of teenage girls there who were clearly heading down an express route to Fat City. The males all looked sloppy and out of shape. Fashion is cruel. The men were all wearing baggy jeans and sweats, while the women were wearing snug jeans, tights, or some variety of yoga pants. And, as I’ve said, they were not thin. Please, people. I was surprised that the other major demographic represented was elderly women. There were a lot of them, in groups and alone. Perhaps their husbands had already died of blocked arteries and now they were just trying to keep up a matrimonial tradition. At one point a young fellow dropped a slice of pizza onto the floor. I looked away. It was an embarassing position to be put in. I mean, what do you do? There was no garbage nearby. He couldn’t put it back on the buffet hoping no one would notice. He didn’t want to take it back to his table. So what then? I like pizza. I think most people do. It’s also very, very bad for you. Especially when you eat it in large quantities. And at a buffet, you eat everything in large quantities. That’s the point. So this is very, very dangerous dining. But it was tasty (even the salad! ), and if you’re really hungry this buffet offers up more calories per dollar than any other restaurant meal I can think of. Plus the service was great. The only thing I missed was a thin-crust option. That would have been nice. So I know I’ll be back. But hopefully not for a couple of months. When it comes to losing weight there’s a lot of silliness and faddishness out there being peddled by the diet industry. I’ve lost a fair bit of weight and kept it off. I’m posting what I’ve learned here as a public service announcement. First of all, people need to stop worrying about the relative merits of carbs vs. no-carbs or other tangential issues and stay focused on the bottom line. The way forward is simple, if not easy. The basic principles are not complicated, or expensive to put into practice. In fact, losing weight will save you money, both in the short and in the long term. And it’s better for the environment too! Overweight people of the world rejoice! You have nothing to lose but a few pounds. Just as Aristotle said about cultivating virtue, the way to lose weight is all about establishing habits through a routine. The fundamentals are easy to grasp: eat less, do more. Just remember that these aren’t things you only do some of the time. “Cheating” doesn’t just have a minor impact around the edges. If you cheat at this game, you lose. It’s far easier, faster, and more enjoyable, to consume calories than it is to burn them. It’s a lifestyle thing, but diet is the most important component (by far). One corollary to the axiom that it’s easier to gain weight than it is to lose it is that exercise is less important than diet. Far less important. Indeed, there was a British report that came out this year saying that exercise (or lack thereof) had no relation to obesity at all. I think that’s overstating things, but you get the point. Exercise provides all kinds of health benefits (for your heart especially), and is the only thing that is going to shape your body, but if weight loss is your goal then you’re going to have to watch what you eat. If you do want to go the exercise route, keep a couple of things in mind. First of all, remember the importance of routine and how important the little things are to a routine. If you can, walk to the gym. That may do you more good than what you do when you get there. Walking is the best exercise there is. Second, if you’re going to exericse try and work up a sweat. Don’t just go to the gym to stretch and look good in your fitness gear. A rule of thumb is that if you’re on a machine you should barely be able to carry on a conversation with the person next to you. You can’t eat healthy at a restaurant. You just can’t. No, I mean it. You do eat too much. Chances are that if you live in North America you’re consuming two or three times as many calories per day as you actually need. That’s too much. You don’t need to take in that many calories. So why do you? Not only do you eat too much, but what you eat is junk. Do you abide by the nutritional standards of the Canada Food Guide? Like hell you do. According to one recent report I read, only 2% of Canadians follow these guidelines. Two percent! I don’t think any of this was meant as comedy, but it is funny. Now: let’s be serious. You don’t eat like this. You are not a model or a professional athlete and you don’t have an in-house dietician/cook. No, you eat junk. Why? Because it tastes good and is convenient. Remember the first of Michael Pollan’s three simple rules for healthy eating: “eat food.” Not everything you stick in your mouth and digest is food. They call it junk food but that’s a misnomer. It’s not food at all. It’s junk. You are literally eating garbage. Cookies aren’t food. Chips aren’t food. Chocolate bars aren’t food (but chocolate supposedly has some heart benefits so I sometimes indulge). Pop isn’t food. Ice cream (even “real” ice cream as opposed to the label of “frozen dessert”) isn’t food. This crap is the enemy. If you can’t beat the junk food habit, you are in trouble. You only have to be disciplined two or three times a week. On your trips to the grocery store. If it’s not in the house you can’t eat it. If it is in the house, you will eat it. Quickly. If you want to keep the weight off you have to stick with the program that you lost weight with. It’s a treadmill I’m afraid you can’t get off. You will always feel hungry. I hear lots of people say that dieting doesn’t work because you just gain the weight back again. Well of course you do. You have to stay on the diet to keep the weight off. You can’t lose fifty pounds on a diet and then consider it Mission Accomplished and go back to eating the way you did before. You’ll just revert to your old weight. I would have thought that was obvious, but it surprises some people. It quenches your thirst, has no calories, and is better for you than energy drinks or even most fruit juices. Drink lots of it. Overview: A “fresh Mexican grill.” But doesn’t Mexico have incredibly high levels of obesity? According to a 2010 study seven out of ten Mexicans were overweight with a third clinically obese. Should I be jumping on this train? Label: I didn’t see a nutritional guide at my location but one is easily viewable online. The only problem with it is that it only gives you information for one serving size, which I take it is the “regular” size burrito. Since I had the large burrito, what should I do? Double the amounts? That’s what I did when converting the numbers for a Subway Six-inch Sub to a Foot-long, but I’m not sure it’s entirely accurate here. Still . . . what else do I have to go on? The thing about these numbers in nutritional guides is that they’re all slanted toward the best possible scenario. I usually eat the worst possible scenario, and more than one of them. Anyway, assuming a large shell with double the regular ingredients the total comes to 1,320 calories. That’s about 100 calories more than the Subway sub I usually get, which sounds right. Sodium was just under Subway, probably because I was substituting chicken for cold cuts. It was still pretty dangerous though, at nearly 2,500 mg. Fat came in at 45 g (arond 17 g of saturated fats), which was surprisingly good (again, relatively speaking). Review: Overall, I find these little guys to be a tasty and filling treat. My one objection is that they tend to go overboard on the beans. I wish I could substitute something else for all the beans but I don’t think that’s possible. I mean, you have to have some beans in there but I don’t like too much because they tend to overpower the rest of the burrito. It’s also important to get someone who knows what they’re doing making it. This is obviously important in the wrapping because they have to be rolled up pretty darn tight so they don’t start to drip too much and come apart when you’re eating them, which is something that I’ve found to be a problem. But they also have to spread the beans out and mix the other ingredients in when they’re being assembled because otherwise you end up eating big mouthfuls of nothing but beans and shell. I do think the price is a little high, though I guess it’s comparable to any of the specialty subs at Subway — which, for me, is this meal’s main competition. I think because it’s such a tight little package I just feel like I should be getting more for my money. Even the large burrito is only about the size of my fist. I’ve never seen a regular-size burrito so I can only imagine how disappointing they must seem. Overview: If it says “Farmer’s Market” that means it has to be bad for you, right? Label: Oh my. These come in a package of six and I eat three one morning and then three the next. That equals a truly whopping 81 g of fat (18 g of saturated fat). That’s 120% of my daily value. And that’s without butter, which I add a lot of. Also 78 g of sugar and 840 mg of sodium. 1,320 calories. I know breakfast is the most important meal of the day, but with this kind of a breakfast you can, and probably should, take the rest of the day off eating. It’s that impactful. Review: I almost always start my day with a bowl of cereal and some orange juice, but every so often I indulge in a package of muffins. And it is an indulgence. The word has long been out that muffins are bad for you. Basically they’re no different than eating cupcakes. Tasty, sure. And since we’re biologically programmed to never have enough fat . . . The fat is incredible. I mean, these cupcakes are downright greasy. When you slice through them the inside of the muffin sticks to the knife like it’s some kind of icing. I just hope you all appreciate how I’m killing myself to be a guinea pig for this column. Price: $3 for a package of six on sale.